It's been an extremely difficult few weeks for the millions of folks who have been affected by Hurricane Harvey and Hurricane Irma. The storms also coincided with back to school so many teachers have been wondering - how do I help? Or what can my school/classroom do to help? Since so many ideas are going around, I felt it might be helpful to put together a blog post with a compilation of ideas. In order to help, first you have to find a classroom or or teacher who needs help. The quickest place is probably to look online and on social media. If you are in a Facebook teacher's group look for posts there. I found a comment on another teacher's Instagram story about a google doc sign up for adopting a classroom and used that. I also noticed there is a website called Adopt-a-Classroom. My teacher blogger friend Barbara Balius sent me a message about her school's GoFund Me page. You can also go directly to GoFund Me because when I looked there there were plenty of places that needed to still raise funds. You can also reach out to your teacher friends. You probably know, especially via Facebook, people in areas affected by hurricane and other natural disasters. Send a message, see if they are okay, ask how their classroom is an find out what they need. After adopting a classroom, if that is the route you are going, you will likely either get an email address for the teacher in need and/or a Amazon wish list. The teacher I adopted had both so I reached out via e-mail first. I also asked her what else is on her wish list besides what she posted on Amazon. 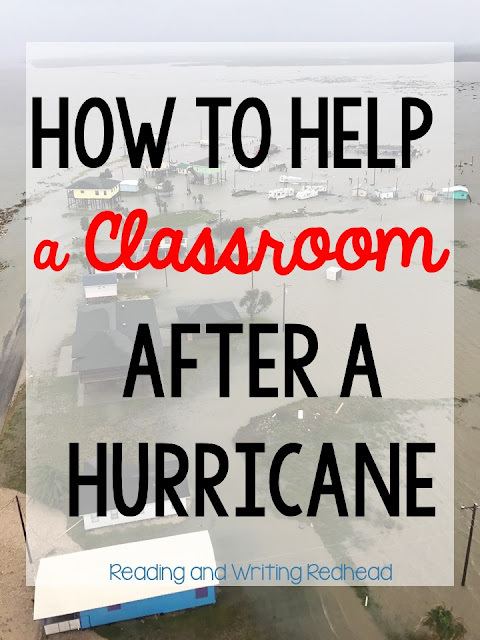 From what I can tell, being affected by a natural disaster and losing everything in your classroom (or almost everything) is very overwhelming. Teachers may also be involved in the clean up and rebuilding efforts. My teacher was and so she was spending 8 hours a day at the school gutting it and told me she was more exhausted than she had ever been and felt like she had little time to make a mental list of what she would need. So I thought of about ten high use items in my room and asked her if she needed them. Also, many teachers may be displaced from their room and be teaching in a different location or even a building that is not a school. My teacher's school is borrowing space from a church but they have to carry in and carry out what they will use every single day. Rebuilidng is tough, but teachers are very appreciative of help and support from anyone willing to give it. I started by discussing things with my principal and grade level team. A fellow teacher decided to adopt the teacher from Texas with me, since I felt she had a need for so much and we felt it was more like she would get more help if we worked to together. As a school we began discussing what we could do. We are a PreK-2 school so we decided that directly discussing the hurricane and showing images might be too scary for our littlest kids, so we are doing a coin drive and providing a link for parents to donate directly through the Red Cross. Our principal felt comfortable with the older students being more involved and adopting classrooms. I also reached out to my students' parents, explaining in an e-mail and detailed blog post what we are doing and how adopting a classroom works. I received some positive feedback and right away a few folks got our Texas teacher some of her wish list items. I read some advice on different websites about how to talk to your class. Healthychildren.org has an article with some good advice.They state "While children may seek and benefit form basic information about what happened so that they can understand what is happening in their word, they (and adults) do not benefit from graphic details or exposure to disturbing images and sounds". When I discussed the hurricane with my class, they all knew about it and I explained that because of the storm, there were terrible floods and that some classrooms were completely flooded and everything in the classroom was ruined. We talked about how the teacher and students might feel and how we would feel if it happened to us. The American Academy of Pediatrics also has a terrific post here. They mention the importance of acknowledging the children's feelings. They stress the importance of "listening and responding in an honest, consistent and supportive manner". If you connect with a specific teacher, you will likely get an official Amazon wish list or a wish list via e-mail. Amazon is easy! I just looked up her wishlist, found an item to send, and added it to my cart. Then, once I went into the cart, her wishlist address popped up on the left in my addresses options, so I clicked that and proceeded to send and ship it (free with Prime). Also because Amazon wish lists have a nice link, I just included that in my e-mail to parents and the blog post on our classroom blog. Another idea I had was using Scholastic Book Points to send books to her. Here is a quick (less than two minutes) video explaining it! And if you are not a video fan, here is it in a nutshell. My students suggested books to send. I looked them up on the Scholastic Book Club site. If I found one I "saved" it by hitting the heart button and then choosing "wish list" (basically like favoriting it). Then I am going to go today and submit our own classroom order, which will give us more book club points. After that, I will put as many books as I can in an order, use the book club points so it won't cost a penny. *Additional information. I was just ordering the books for her, and technically you need one paid item to get free shipping, so I ordered one copy of Ralph S. Mouse, which cost $1.00! And another glitch - Scholastic Book Clubs does not seem to allow you to change your mailing address so the books will just have to be sent to me and I will take the box to the Post Office. I think they could go media mail which is the cheapest. Still, I was able to get 29 free books for our Texas Teacher and just have to pay to ship them from the post office! Yay! If it is a challenge to find a way to donate hard goods, you can do a coin drive with your class or school, you can encourage students and parents to donate to an organization with a good reputation like the Red Cross or use a site like GoFund Me to donate money. My school also one did a fund drive with a Hat Day. Students were allowed to wear hats but had to donate $1.00 or 50 cents and that money went to relief for the disaster in Haiti. There are definitely many ways to be creative with it! So, do these ideas help or inspire you? What are some others ways that you and your class have helped out? Please comment and share them! Thank you!